Produkt Krajowy Brutto ( PKB) na mieszkańca w Polsce na koniec 2012 r. wynosił 67% średniej UE. Z tabeli wynika, że ostatnie 3 lata zamożność Polaków rosła w tempie 2 %, więc najprawdopodobniej na koniec 2013 r. będzie w granicach 69 - 70 % średniej 28 krajów UE. Short Description: <I>Data from 15th of November 2013. </I> <P> For most recent GDP data, consult dataset <a href=http://appsso.eurostat.ec.europa.eu/nui/show.do?dataset=nama_gdp_c&lang=en target="_blank">nama_gdp_c</a>. <BR>Gross domestic product (GDP) is a measure for the economic activity. It is defined as the value of all goods and services produced less the value of any goods or services used in their creation. 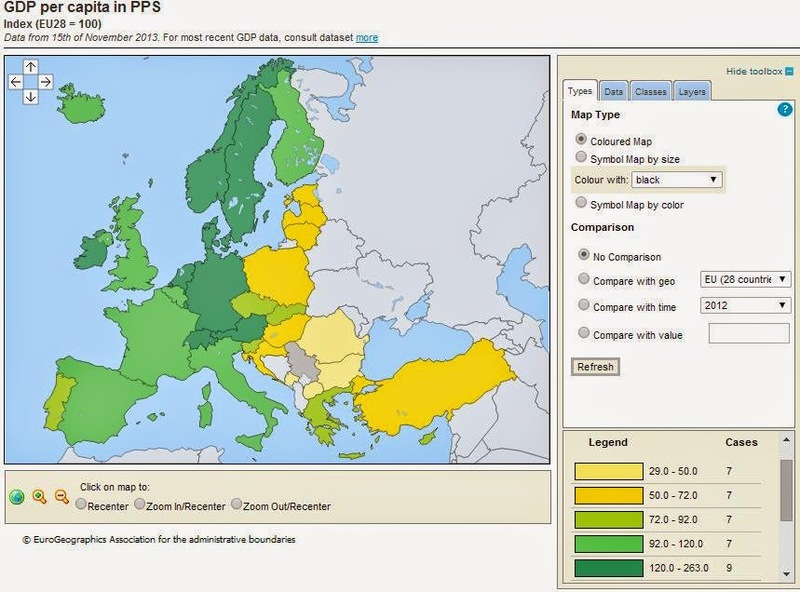 The volume index of GDP per capita in Purchasing Power Standards (PPS) is expressed in relation to the European Union (EU28) average set to equal 100. If the index of a country is higher than 100, this country's level of GDP per head is higher than the EU average and vice versa. Basic figures are expressed in PPS, i.e. a common currency that eliminates the differences in price levels between countries allowing meaningful volume comparisons of GDP between countries. Please note that the index, calculated from PPS figures and expressed with respect to EU28 = 100, is intended for cross-country comparisons rather than for temporal comparisons." Polska ze wszystkim jest biedna.Pozdrawiam.